In the past, reports estimated that women consumed several pounds of lipstick over the course of their lives. Although this myth has recently been debunked, it is well-known that women do accidentally consume a small amount of lipstick. For this reason, it is crucial to be concerned with the ingredients in your lipstick. Read on to learn the potentially harmful ingredients contained in many standard lipsticks and how to avoid them. Traditional lipsticks are packed with harmful chemicals, additives, preservatives, and harsh substances that add lasting, smooth color to lips. Following is a list of standard ingredients, the purpose they serve, and why you may want to consider avoiding them. Mineral Oils – These substances (Paraffin, Petrolatum, Cera Microcri­stallina, Ozokerite, or Paraf­finum Liquidum) are derived from fossil fuels and are included in lipsticks as a form of moisture. Parabens – These synthetic compounds serve as preservatives in many lipstick formulas. Parabens have been linked to negative effects on a variety of systems in the body since they act as hormone disruptors. 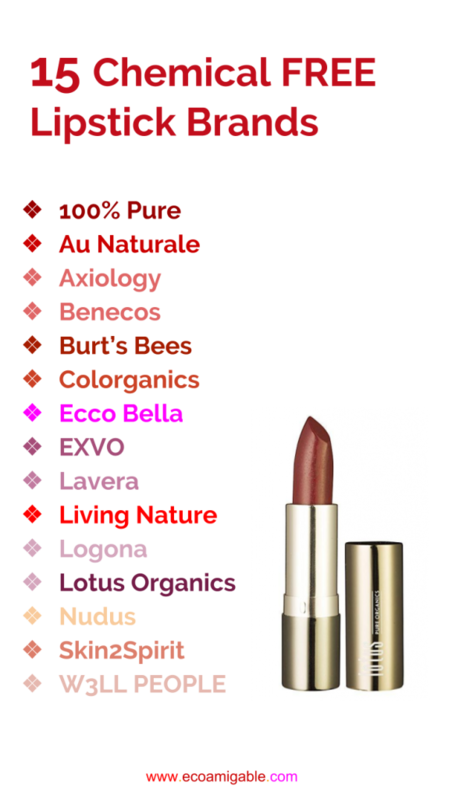 Lead and Other Heavy Metals – Lead, a neurotoxin that has been linked to learning and behavioral issues, is often found in commercial lipsticks. Along with lead, lipsticks sometimes contain a variety of other heavy metals such as chromium and aluminum. Companies do not intentionally add these metals but they end up in formulas due to contamination. Chemical dyes – These dyes provide lipstick with their color shades and add lasting pigment to the lips. Fragrances – Synthetic fragrances are designed to give lipstick a pleasant scent but it may come at a price to your health. Artificial fragrances often hide phthalates – compounds that are linked to a host of health issues. As with parabens, they act as endocrine disruptors. If you love brightening your lips and adding a pop of color and shine but want to avoid the possible health effects of conventional lip colors, the good news is that a growing number of non toxic lipstick brands are creating healthier alternatives. These companies utilize natural ingredients to create chemical free lipstick that is better for both your health and the planet. Traditional lipsticks may be great for your lips but harmful to your health. The most important aspect of buying a lipstick is reading the ingredient label carefully. Consider testing out healthier, non toxic lipstick brands that steer clear of questionable ingredients.